Close to 19,000 cyclists are killed or injured on UK roads every year. Now, that's a hell of a lot of people, and in most cases these accidents will have involved a car, lorry or equivalent. 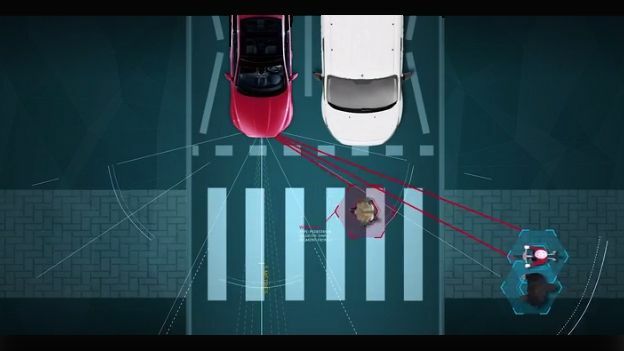 Thankfully, Jaguar Land Rover is answering the call, and its new 'Bike Sense' technology uses sound, colour and touch to warn you when there is a cyclist nearby. Example. You're driving home, and a cyclist is behind you in traffic. Bike Sense's sensors can detect a cyclist well behind you, and LED lighting on the dashboard, window sills and windscreen pillars will go from amber to red as the bike approaches. If the system detects the bike is overtaking, it grabs your attention with the tring of a bicycle bell (to the left or right, depending on which side the bike is on) and part of the seat will extend to literally tap you on the shoulder. Clever stuff eh? "Human beings have developed an instinctive awareness of danger over thousands of years," said Dr Wolfgang Epple, Director of Research and Technology at Jaguar Land Rover. "Certain colours like red and yellow will trigger an immediate response, while everyone recognises the sound of a bicycle bell." More clever things are occuring even when you've stopped. If you put your foot down on the accelerator and Bike Sense has detected a cyclist around the car, the pedal will vibrate to warn you. Similarly, if you try to get out of the car and Bike Sense knows there's a bike approaching on that side, the door handle will light up, vibrate and buzz to make sure you don't cause a nasty accident. All these warnings are designed to trigger an instinctive reaction in your body to stop what your doing. And those few seconds could be the difference between life and death for a cyclist. Or maybe even for you. There's no specific news yet on when this tech will be going into cars, but we'll update with more comment as and when we have it.